I purchased several cookie cutters from our local Michaels craft store last year and had a great deal because when I got them it was after Halloween. I think I paid less than $1 each since they were clearance items. Can't beat that right? As always with this time of year, we have so many activities planned and my calendar is almost full till around Christmas. All is FUN and I actually can't wait. It's the inner child in me, lol! You may have noticed that I've not used food safe marker in a long time, years maybe. That's because Nikolai simply won't eat any cheese or bread that I colored with the food safe markers. 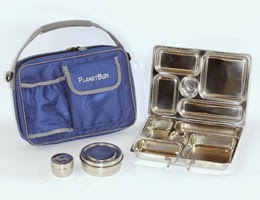 Every single time he would come home with untouched food which I had, I thought artistically, colored. I'm not sure as to why. I have asked him but he just kept quiet. I learned, however, not to color his food anymore. I thought this lunch would look nicer if I've colored the faces but I'm sure that he'd not eat the top part if I'd done that. 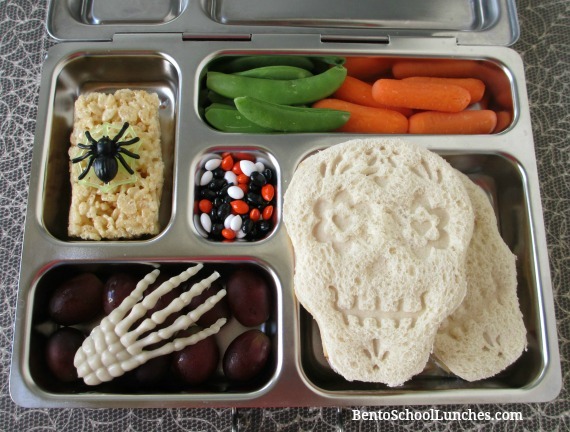 In this bento lunch (packed in a Planetbox): A couple of day of the dead stamped sandwiches, seedless grapes with a skeleton hand, chocolate covered sunflower seeds, Rice Krispie bar with a spider cupcake ring, sugar snap peas and organic baby carrots. Time to head out to Michaels and see what they have there! What a fun lunch, Rina!